The process of restoration of the geometry of the turbine blade stylus TS (turbostarter) manufactured by casting of heat-resistant alloy ЖС6-К of aviation turboprop engine НК-12Мп is analyzed. A comparative analysis of two types of recovery of stylus’s geometry has been carried out: the reduction by soldering with powder solder впр24 in ceramic forms and laser powder cladding впр24 in a powder bath. The structure of reconstructed layers by means of electron microscopy with elemental analysis of transverse microsections has been explored. It is recommended to use pulsed laser powder cladding (build-up welding) for this purpose. 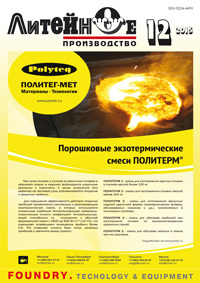 There is given a short review of literature on casting with crystallization under pressure, wherein the basic schemes of pressing the solidifying castings, new dies, and pressing equipment, examples of developing processes for specific castings, structure and properties of the latter are discussed. Key words: Casting, pressure, alloys, cristallisation, solilification, structure, properties. The paper contains data about modern state of electrophoretic shaping mold, results of experimental studies of shell molds’ stress strain state made by electrophoresis and data analysis. The paper raises issues of strength properties formation of electrophoretic shell molds depending on types of the binder and possible reasons for cracks formation. Key words Electrophoretic mold, stress strain state, shear modulus, monolayer mold. This publication devoted to modern methods of design, production technology, as well as the methods of calculation and simulation of strength reliability of production processes cast housing part stepless HVMT considered analysis of engineering simulation to the settings in ICS NovaFlow. Key words: Transmission; engineering simulation; production technology; computer-integrated engineering. The article was tasked by computer simulation of the filling process, to explain the causes of instability when applying veneer on the surface mesh of the mold and determine the direction of work on their elimination. It was suggested that the device on which the application for the invention. The device is installed between an inflatable stove pescetelli machine and mesh mold and allows inflated simultaneously, as in the Central hole and the holes located around the circumference at the mid-radius of the mold. Simulation of filling the gap sand-clay mixture with the device showed a significant increase in the dynamics of filling of the cladding, which by the time of 0.15 p. density reaches kg/cm sq or more, compared to blowing only through the Central hole that was previously done in experiments on pescetelli car. Key words: Wire mesh mold, veneer, sand-clay mixture, computer simulation device for blowing.